Do You Need Office 2007 in Your Small Office? Microsoft Office 2007 is big, bloated and brilliant. There is a plethora of new features for PowerPoint, Word, Excel (the jewel in the crown) and Outlook, my other husband. Microsoft recently brought the 2007 show local and I couldn’t resist spending an intimate day with hundreds of other geeks. When the demonstrator’s overloaded power laptop blue-screened, the crowd of small business owners cheered. We’re a testy bunch when it comes to ROI on computer purchases. The most user-challenging feature will be the “Ribbon,” which replaces the two friendly toolbars we know, love and customize. Office 2007 is intuitive. The ribbon morphs unasked into the tasks it thinks you want to do next (called “contextual tabs”). If you’re in a table, it moves to table commands in a disconcerting and resource-sucking visual blip. I predict we’re going to lose monitors due to thrown objects caused by ribbon morphing, but right-clicking is a better alternative. Microsoft promotes it with ‘[T]he tabs on the Ribbon display the commands that are most relevant for each of the task areas in the applications.’ Remember that the question of relevancy is highly individual with power users. The Home button provides easy access to the most frequently used Office commands. To new 2007 users, it’s an extra click, a superfluous layer, another mouse move but in reality, it’s the place to click to share, print, publish, and send documents. Do you send Word or Excel files? Word 2007 saves in a new format (no more .doc) and you’ll have to “save as” an “older” version (that’d be XP, which is lumped into Office 95 as an antique format) to share with those not yet blessed with Office 2007. A happy new feature is “save-to-PDF” and sending PDF files is the best choice anyway. Recommendation: send PDF files whenever possible. Do you have the techno-horsepower? Upgrading your current Office version might be cheaper than buying new, but it is time-consuming to load, resource-intensive and requires more RAM and better video (especially if you’re considering Vista). Office 2007 is exceptionally graphical (and resource-intensive). In preparation, we upgraded our machines from 1Gb to 3Gb of RAM (older RAM costs less) and double-checked the video cards to make sure they had at least 128Mb of on-board RAM (we replaced only two because we knew it was coming 2 years ago). Call your IT folks and talk it all over before buying Office 2007 or Vista. 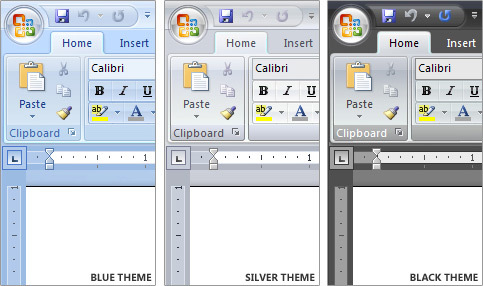 Does your business need Office 2007 with its bells, whistles, contextual tabs, galleries and Ribbon now? At the demo, the leader pointed out that things the “geeks” could do are now available to “regular” users like ‘us’ (well, them). The quandary: those things were always available and regular users could rarely do them so what makes you think they’re going to start doing them now because they’re prettier? The reviews are in. ZDNet advises that if your current version works, don’t upgrade even though there are significant improvements to Excel formula referencing, pretty PowerPoint, and better document recovery. They note that the drastic design changes demand a steep learning curve and the new interface isn’t intuitive. If you’ve got power users, they’re going to love Office 2007. Regular users will face a learning slippery incline (not quite a steep curve). Your costs for both software and people frustration may vary.